JACKSONVILLE, Fla. — For those of you who collect quirky notes on geography, you may know that, technically speaking, Jacksonville is the largest city in the U.S. Yes, it's true: bigger than New York City, Los Angeles and Chicago. Bigger than Houston, Dallas and San Francisco. Of course, we're talking about sheer land area, not population. The Jacksonville metro area includes three beach cities, five counties and about a million people. When the people voted for consolidation in 1968, the city's land area exploded from 39 square miles to a whopping 841. For golfers, that means a lot of driving. But, even that large land mass can't contain all the golf courses. The city limits hold quite a few old, established courses, many of them excellent tracks, like the venerable, Donald Ross-designed Hyde Park, the well-groomed muni, Bent Creek, Windsor Parke, the exceptional but private Pablo Creek, Queens Harbour, Deercreek, Hidden Hills, and the new Panther Creek, to name just a few. Still, with all that land, it is on the geographical extremes of the city that a number of new and exciting courses have opened. To find them, get out of town and head north and/or south. To head north from Jacksonville, take the quick and easy route, Interstate-95 if you're in a hurry to tee off. If you want a more scenic route, turn onto Heckscher Dr., which will take you island-hopping along the St. Johns River, passing a number of old fishing camps and wide, beautiful views of the Atlantic Ocean before finally depositing you at peaceful and serene Amelia Island. 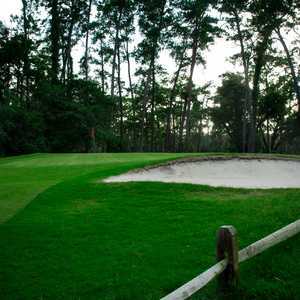 The North has some exceptional courses, spearheaded by the four courses of the Amelia Island Plantation. The plantation recently bought Royal Amelia, to go with its collection of Ocean Links, Oak Marsh and Long Point. Ocean Links, as the name implies, is one of the rare Florida courses that actually gives you ocean views, and in this case, they are expansive and impressive. It can be short and nasty, unlike Oak Marsh, which is longer and substitutes Intracoastal Wateway views for the ocean. Long Point is a highly-regarded members-only course, while the formerly public Royal Amelia is another good layout, which unfortunately charges too-high resort rates. The best deal here is North Hampton, one of the top courses in northeast Florida with more than reasonable green fees. It is a beautiful course in Fernandina Beach, with 10 spring-fed lakes, frequently held back by boulders, and wild grasses whipping in the wind. The sheer variety of holes and imaginative flair that have gone into the design are impressive, even spectacular. The Golf Club of Amelia Island is another beautiful course, very much in ritzy harmony with the well-heeled resort community of Summer beach. The fairways are a deep green, lush as lush can be. Little pockets of bright flowers are interspersed intermittently throughout the course, another resort amenity for resort guests to ogle. Fountains flow from the lakes and ponds. The big excitement around here is the impending opening of Amelia National, the Tom Fazio design that will add another top-notch course to the area. To the South of Jacksonville lies more wide-open beaches and ideal, sandy terrain for golf course building. Again, you can take I-95 to get there in a hurry, but a more civilized route would be A1A, the beach-side road made famous by singer Jimmy Buffett. Take it south from Jacksonville Beach and your first stop will be Ponte Vedra Beach, home of the PGA Tour headquarters and the TPC Sawgrass, with its famous Stadium course and little brother, the Valley course. The Stadium will be getting a makeover after the 2006 Players Championship, but it will be largely left undisturbed as one of Pete Dye's legendary designs. You may want to stay a while at Ponte Vedra — be sure to eat at The Monkey's Uncle — because it's also home to the excellent Marsh Landing and the Ocean course at the Ponte Vedra Inn and Club, designed by a British architect named Herbert Strong back in the roaring '20s, back when earth-moving equipment was a future fantasy. Herbert used mules, so the story goes, dragging "slip pans" to move the little earth he needed, mainly pushing dirt to the fairway borders to create dunes and building the little hillocks that dot the terrain. Now you're ready to hit the road again. A1A will take you south through wind-swept dunes, the little town of Vilano Beach, over a bridge and eventually into the historic city of St. Augustine. St. Augustine has lost some courses, but added some great new ones. 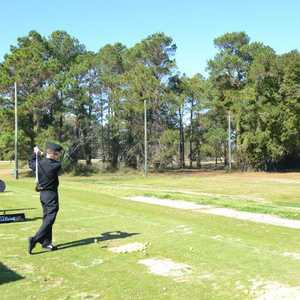 The most notable addition is the fairly new World Golf Village and the Golf Hall of Fame, to the west of I-95. Two courses associated with it are the Slammer and Squire, a design by Sam Snead and Gene Sarazen, and the King and the Bear, a collaboration between Arnold Palmer and Jack Nicklaus. You'll want to linger here as well, because of the Palencia Club, an exquisite jewel of a club — if you can get on because it's private — and the Golf Club at South Hampton, not as good as North Hampton, but an excellent play in its own right. Don't linger long, because Palm Coast awaits. This is the southern end of the First Coast, and some of the courses are "claimed" by Daytona Beach as well. Like the truly exceptional Ocean Hammock, which is what Florida golf should be all about, taking advantage of the state's bountiful, sub-tropical scenery in all its glory. You first get a glimpse of the big pond on No. 1, just beyond the palms that front the growth-covered dunes. That's just the appetizer because no fewer than eight holes play along the ocean. You can hear it, taste it and see it. It may seem funny to say it in a state with thousands of miles of coastline, but to actually see the ocean from a Florida golf course is quite a treat. Another Hammock, Hammock Dunes, is a Rees Jones layout, routed through wooded surroundings, through cypress and slash pine, with marsh and creek views. There are 10 lakes forming 40 acres in all, bringing water into play on six holes and marsh on three of the back nine; 13 wood bridges take you over the wetlands. There are no homes on the site, and the 450 acres of conserved land protects its pristine nature. Matanzas Woods is another solid track to play here.